We all heard that an apple a day keeps the doctor away, but not many people know that only one pear a day could reduce the risk of obesity by 35 percent. Eating one medium fresh pear each day has a positive effect on nutrient intake, scientists believe. No wonder, as this fruit has high percentages of fiber, vitamin C, magnesium, copper and potassium. A single medium pear of 100 calories contains nearly 24 percent of the recommended amount of the daily fiber. Traditional medicine has long noticed such properties of pear as giving a cheerful mood. In Azerbaijan, where fruits are available around the year, people can enjoy pears to stay healthy and happy even when the weather is cold. This tasty fruit is effective against fever, chills, colic and diarrhea. Pear and pear juice improves the complexion and prevents vomiting. The fruit is even recommended to pregnant women. Being hypoallergenic, pears are also considered one of the best first fruits to introduce to a child. Pear eliminates the thirst and dryness of the mouth, regulates the activity of sebaceous glands, reduces pain in the kidneys, has beneficial effects on urination. In addition, it has a therapeutic effect on the salt, stones and crystals in the kidney, urethra and joints. The debates about the exact origins of the fruits, but experts believe that European pears and Asian pears evolved separately and during the same approximate time in history about 1000 BC. Certain species of pear are also native to parts of Africa. Several types of pears like Nar Armudu, Sheker, Dash Armudu, are grown around the country that enjoys nine of the eleven possible climate zones. 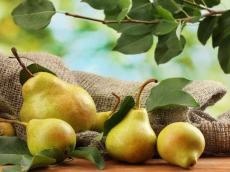 Azerbaijanis eat pears for centuries fresh and dried, as well as concentrated pear juice. Azerbaijanis love this fruit so much that named a tea-glass in its honor, as pear-shaped Armudu glasses resembles this sweet and juicy fruit while drinking tea – another favorite occupation n Azerbaijan. Bear in mind the next time while eating delicious pear in Azerbaijan that it contributes to healthy and slim body.